Furnace tune-ups can save money and prevent problems. Although the cost of the service call feels like one more expense, in the long run, keeping your furnace running optimally can reduce your utility bills and cut down on wasted energy. Clogged furnaces can send dust to clog up the air and create a filmy dust so another benefit is having cleaner air for the family to breathe. This is a sponsored post in partnership with Link Vehicle. As always, all opinions are 100% mine. Here is a list of everything you need to know to make sure your furnace keeps you warm all winter long. 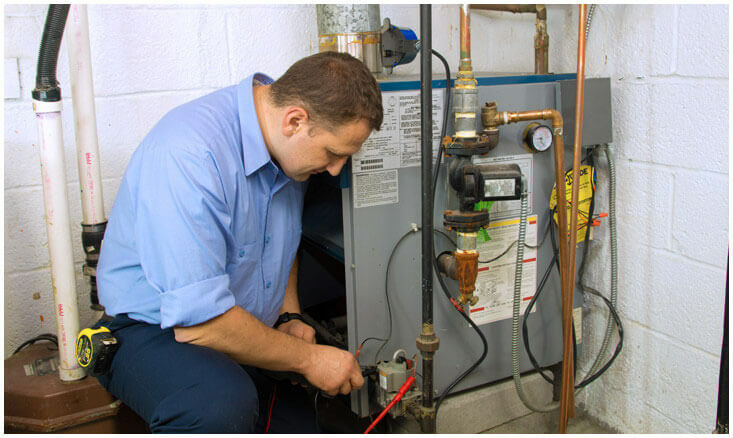 A furnace tune-up is a service offered by technicians who will come to your home and make sure your system is free from problems and capable of handling cold weather. There are a few different things that will be checked during this appointment. Thermostat settings are checked to be sure the furnace is running properly. Get more information from the energy.gov website.. When you schedule annual maintenance for your furnace, you can trust that a qualified technician will be sent to take care of any concerns and make sure your home is safe and secure. Even with this knowledge, it’s important to research the company you’re considering rather than just calling the first number in the phone book. There are varying levels of experience among professionals and you want to make sure you hire only the best technicians to take care of your home. What is their warranty like? How long and what does it cover? Are they limited to servicing certain models or are they capable of handling any furnace? When was their equipment manufactured? Are they using out-of-date technology? How long have they been in business? Do they have a significant amount of experience servicing furnaces or are they brand new? What sort of testing and qualifications do they have for their technicians? Asking these questions will give you a good idea about how qualified the company is to work on your home. What Are the Energy-Saving Benefits of an Inspection? While a maintenance call may cost you money, it can actually save you cash in the long run. Keeping your furnace running efficiently reduces energy waste and can cut down your utility bills. A clear filter allows more hot air through, requiring your furnace to put out less and still heat your home. Installing a programmable thermostat is another way to save money, since the temperatures will automatically adjust while you’re out of the house. While the energy savings are a big benefit, you can also count on having cleaner air to breathe once your tune-up is complete. Clogged furnaces block heat, but they also send tiny particles up with your air supply, creating dust that can get in your lungs and settle on your furniture. Your health can be affected negatively by these airborne contaminates and can be subject to major issues over time. In addition to having cleaner air, you’ll also lower the chance that you’ll be phoning a service company from a freezing cold house during the middle of winter and paying top dollar for an emergency service call. When your system is inspected, qualified technicians will be able to locate many potential problems before they ever become an issue. Simple adjustments and cleanings can eliminate malfunctions in the furnace, making it important to have a tune-up before the cold weather really sets in. There is another very important way that a furnace inspection can improve your health, and that’s by allowing a professional to check for carbon monoxide leaks. Several people die or become ill from carbon monoxide exposure each year, making it vital to have a sharp and experienced eye look your system over and be sure there are no possible leaks that could cause potential hazards. Maintaining your furnace can also save money on repair and maintenance costs. Neglected systems are more likely to require expensive parts and service due to damage done by issues that could have been simply fixed during a routine annual maintenance check. These issues can eventually create bigger problems that can even require you to purchase an entirely new system. Do I Need to Have a Tune-up if I Have an Electric Heater? Your system will have different parts and features if it is an electric or gas heater, but both can benefit from furnace inspections. The procedure and knowledge necessary will be unique to each type of system, so be sure to select a company that has experience in both types of servicing. Even with annual maintenance and superb care in furnace services, your system will eventually run its course and require a replacement. It’s important to know the signs of trouble so you can be prepared to call a repair company for fixes and new equipment. If you notice an increase in costs in your gas or electric bill, it could be something as simple as needing a new filter or it could mean your furnace is getting old and running inefficiently. Also, pay attention to how evenly your home is heated. Aging furnaces are unable to distribute the air in your home properly and will not likely be able to keep you comfortable. It’s important to call a service company immediately if you notice these signs so that repairs can be made and further hazards avoided. Taking care of your furnace is simple if you know when it needs to be serviced and how to select a company. Follow these guidelines to keep your system running clear and your home warm all winter long. This is really valuable information for my daughter that now live in NYC, where it gets REAL COLD!